Troutbridge's chance of movie stardom is jeopardised by Phillips' navigational skills. Stars Leslie Phillips. From June 1959. HMS Troutbridge's chance of movie stardom is jeopardised, thanks to the navigational skills of Sub-Lieutenant Phillips! 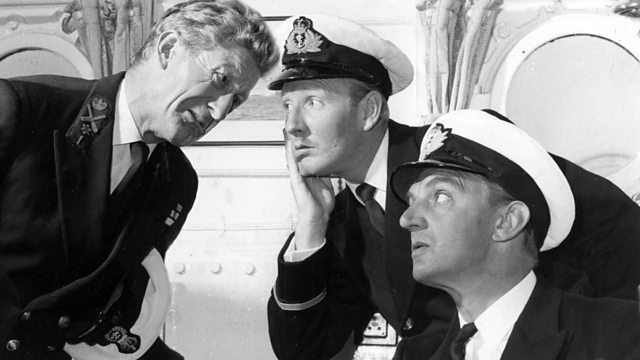 Starring Leslie Phillips as the Sub-Lieutenant, Jon Pertwee as the Chief Petty Officer, Dennis Price as Number One, Richard Caldicot as Commander Povey, Ronnie Barker as AS Johnson, Heather Chasen as Heather, Michael Bates as Antony J Antony and Tenniel Evans as the Admiral. First broadcast on the BBC Light Programme in June 1959.